In this Book Shah Waliyullah briefly traces the history of those of the Prophets from Adam to Muhammad whose ames have come in the Holy Qur'an, and throws sufficient light on their individual perfections. He has shown therein that there were natural causes, visible and invisible, behind every event that had taken place in their life. Even the miracles worked by them were linked with certain causes. Ta' wil al-Ahddith is one of the most important works of Shah Waliyullah of Delhi. On a subject like this, it is indeed a unique presentation. Brevity and employment of a particular terminology are the main features of its style. This small treatise deals with the interpretation of the stories and the explanation of the major events which had taken place during the days of those prophets whose names have come down in the Holy Qur'an. For every event a natural cause has been cited, as nothing happens in the world without a cause. Even miracles have their causes. But, if it is necessary to create a thing, God creates it even if there be no causes, as He possesses infinite knowledge. These causes, however, are known to him who has thoroughly comprehended the science of the working system of the whole universe and has properly understood both the earthly and the heavenly causes working in it. Shah Sahib undoubtedly possessed a copious share of that science. A hint towards that is given in the end on the topic "Wonders of the World". This book has been so named, as all the happenings which happen in the world are like a dream and a vision, and they first appear in the Similitudinary World ('Alam-ul-Mithal) in a suitable form. Some persons who are spiritually advanced come to know of them in their dreams. 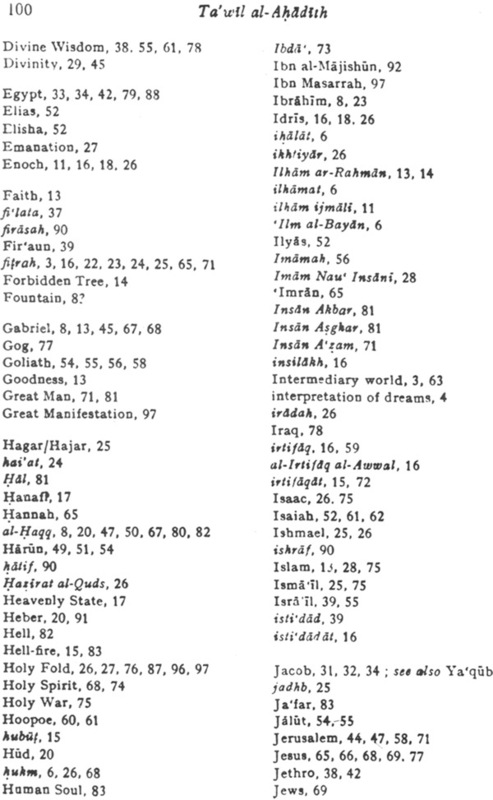 An example of it is found in the chapter named" Joseph" in the Holy Quran. The dream of seven cows seen by the king of Egypt was correctly interpreted by the Prophet Joseph. Shah Sahib himself has explained somewhere the reason of his giving such a name to the book. According to him, for every change which is to take place, there ought to be a required capability both in the prophet of that age and in the people to whom he is being sent. In this work, the history of the evolution of the human mind is traced, and for all the important events, including the miracles, their natural causes have been mentioned. 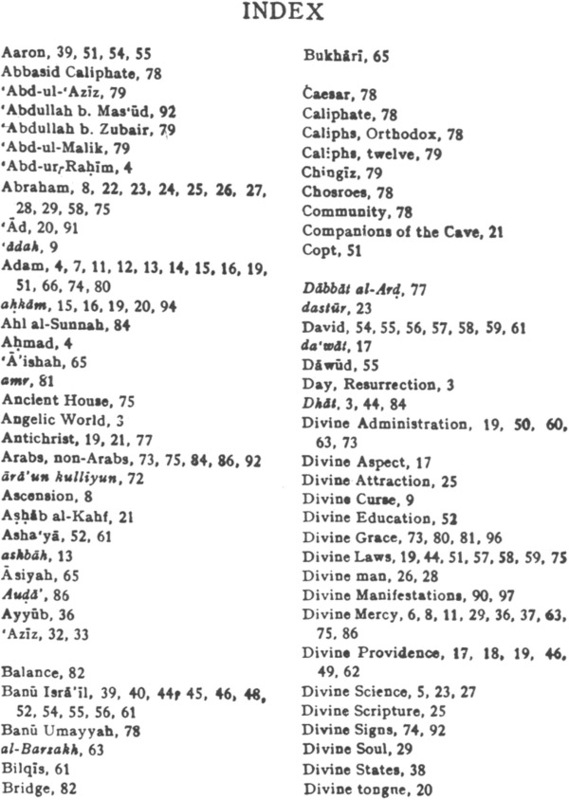 It bears some resemblance to the Fusu ul-Hikam of Ibn-ul-‘Arabi. Shah Waliyullah had studied Fusus under the guidance of his father; thus, there is reason to believe that he had been influenced by the work of al Shaikh al-Akbar, but the Shaikh has not explained, as Shah Sahib has done, the secrets underlying the important events which had taken place in the days of the prophets. The book was first translated by the present translator into the Sindhi language and was published by the Shah Waliyullah Academy, Hyderabad, in 1964. Looking to the usefulness and importance of the book, its English rendering was considered necessary. This book, it is hoped, will appeal to (he modern mind and will be found to its temper and taste. The narration throughout is interesting and appealing. It is, therefore, that Shah Waliyullah has rightly claimed to have come for the scientific age, wherein people were not prepared to accept everything blindly. 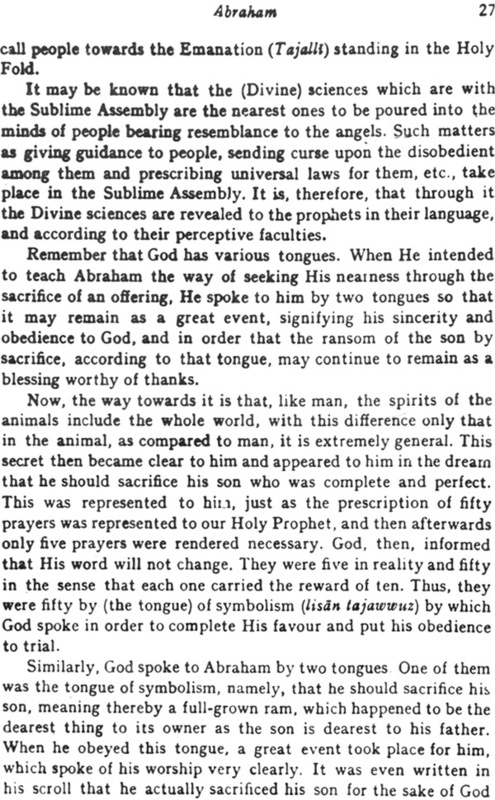 Know that when God sends down a Divine science to human beings through the tongue of a human being, coming down from the Original Source (God) in the form of an emanation towards. 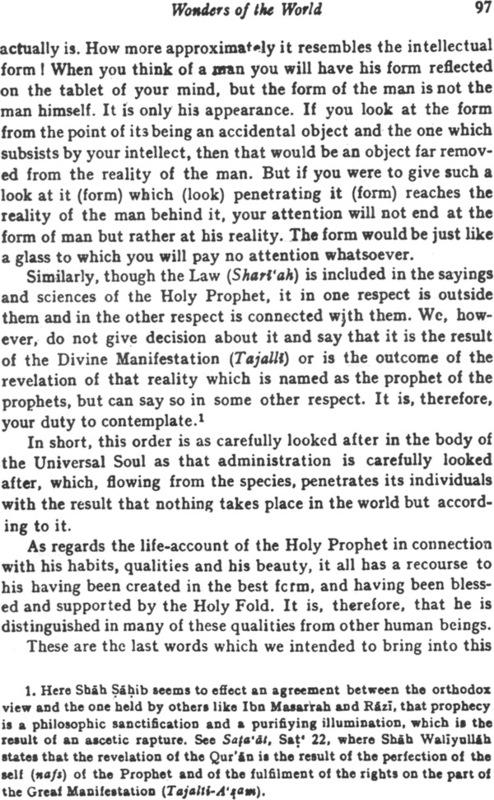 them, the way which it follows is not that of a metaphor or an allusion just as it happens in the sciences of the common people; but its way towards it is that of al-Tajawwur al-Tabil For example, when the knowledge of a certain condition which is to happen to a man is poured into his senses, it (knowledge) is re- presented to him in the form of a dream made of both the voluntary and involuntary actions of the bodies and the animals bearing resemblance in some way to that poured out general condition. There is a man in whom the knowledge is poured that he would soon become a king; he dreams (the symbols of) kingship in the form of a crown or an elephant, and then he sees that someone comes to him and puts a crown on his head or makes him ride an elephant. The interpreter on hearing it (the dream) says that this dream signifies that the dreamer will acquire kingship. By the crown and the elephant is meant the conferment of kingship, while the coming of a man and his putting the crown on his head and making him ride the elephant is a cause of the affair. It is so because man by his nature is disposed to think that there is a cause for every happening; thus unavoidably that cause assumes before him in this dream the form of someone who comes and participates in putting the crown on his head. 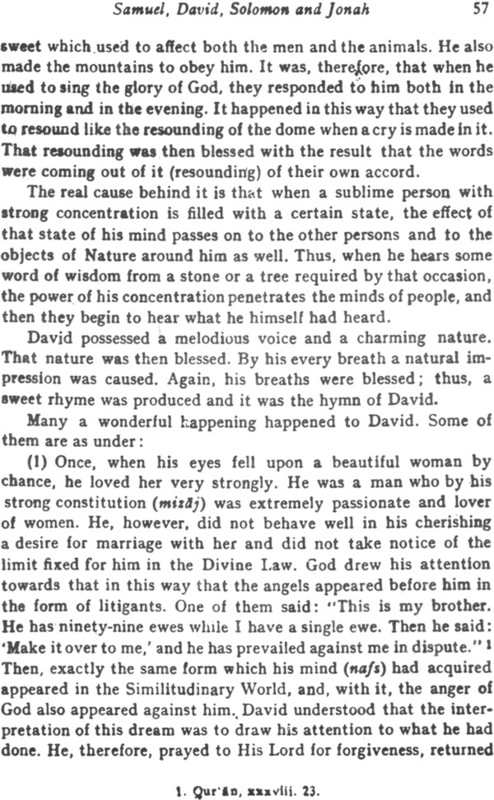 Similarly, when God intends to draw man's attention towards a general reality, the nature (laur) of which transcends the nature of senses, then He draws his attention towards it through a story or a speech, the sum and substance of which happens to imitate His intention, as the dream imitates the desired event. In this respect, by the show of dignity of the kings and the execution of their order in the country when seen in the dream is meant the exaltation and the greatness of God, To that refer the Word of God: "Nay, He, both His hands are spread out,” Similarly, there are other-allegories, such as laughing, etc. Accordingly, when God intended to inform us of His being Generous, He looked at the form of generosity it had in the dream, and that was the spreading of the hands. He, therefore, spoke to us about it in that way. And when He intended to inform us of His being the Administrator (mudabbir) of the heavens and the earth, He looked at the form of administration it had in the dream, and it was the dignity of the kings in the position of their authority. Thus, He spoke to us about it in that manner. However, the foundation of His speech, if you were to thoroughly examine certain forms, is not based on the relations mentioned in the explanatory science ('Ilm al-Bayan). By al-Tajwwuz al-Tabil I mean the imitation of an orderly happening and an event or of a speech implied in an allusion, through a general secret hinting at the connections which the nature (tablah) takes consideration of in the dream, when it receives the general knowledge and forms a picture of it. (1) The intention of God about His servants, namely, to effect administration among them through inspirations (ilhdmat), transformation (ihalat) and the raising of causes (taqribal). Thus, Divine Mercy (Rahmul) personally turns towards the establishment of the best order (nizIm khair) and naturally moves towards finding out an event. He, then, in order to bring about that event, gives rise to an inspiration or to a transformation or to a cause among His servants, and then, according to the usual course, selects the nearest of the things (sufficient to bring about that event) available on that day. 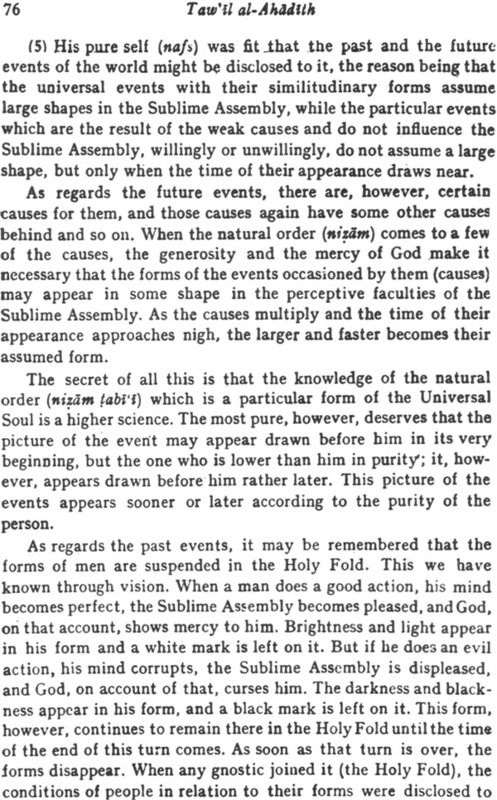 Consequently, an external event gradually appears through the appearance of the cause and the inspiration, and then the natures as well as the minds (nufus) accept that event according to their capability. Now, here, that event is only a form and a dream, while that administration put into effect is a principle and an interpretation. An example of it is as follows: When God intended to appoint a vicegerent in the earth, He created Adam. 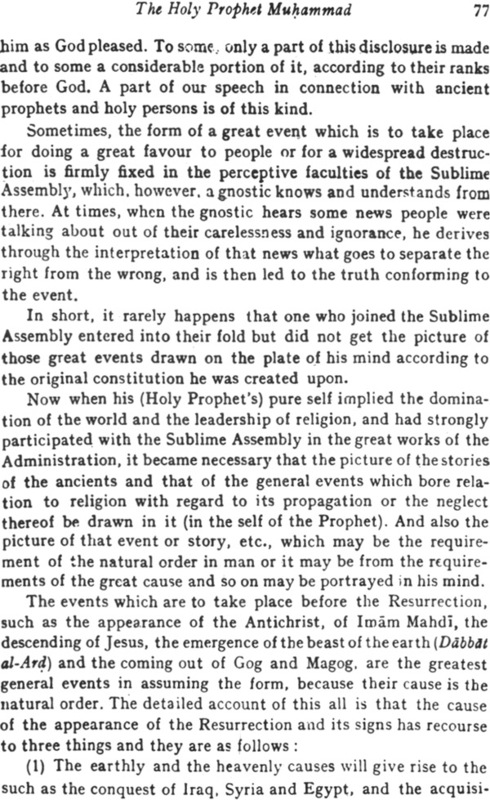 Adam was then encompassed by a simiIitudinary reality by which is meant the Paradise. 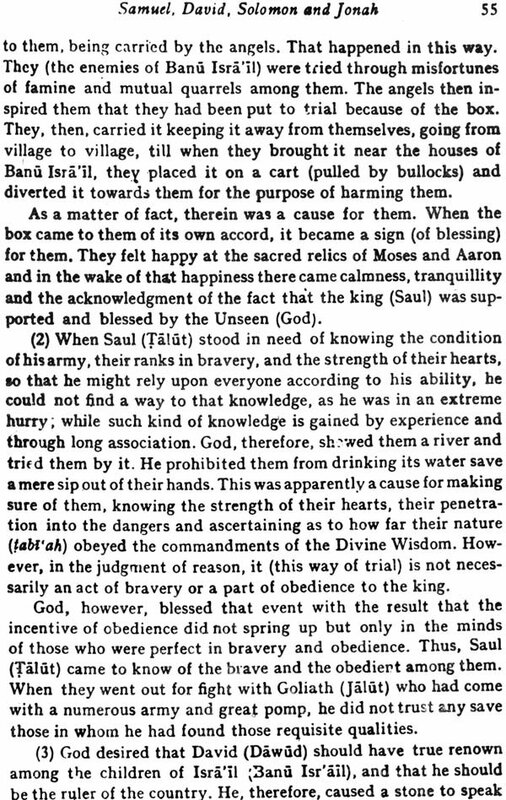 As such, he was dealt with as the inmates of the Paradise are dealt with, and the door of his becoming the vicegerent in the earth became closed.2 There-after, some causes appeared which, according to the purity of his heart, gave him a warning to the effect that his eating the tree is forbidden for him, as this would lead him to his removal from the Paradise. This warning then became a necessary revelation for him. The Satan, who was, essentially mischievous, was well prepared to prompt evil thoughts into his mind. The nature of Adam again was disposed to the eating of the tree with the result that he ate it and, in consequence, was blamed and turned out. 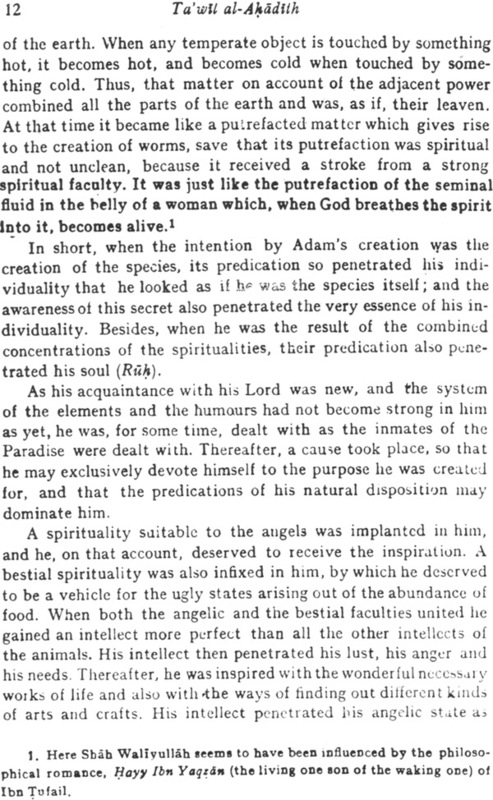 All this was a dream and a vision, the interpretation of which is as follows: God's intention in creating Adam was that he should become a vicegerent in the earth and attain his specific perfection (kamal nau’t). As regards his being prohibited from eating the tree. the prompting by Satan of evil thoughts, his being reprimanded and, finally, his expulsion from the Paradise, all this was a form of the cause according to his coming out gradually from the world of similitude to the world of mortals. 2 Adam, even though he was an earthly person, yet because of his perfection he had acquired another-worldly body, and, thus, was lodged in the Paradise. 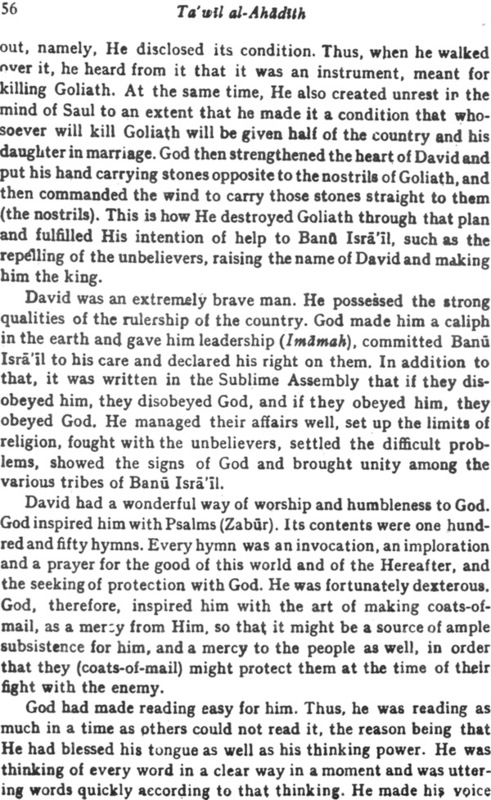 At that time, his body looked like a similitudinary body (Tajhimal, Vol. II, p. 118). 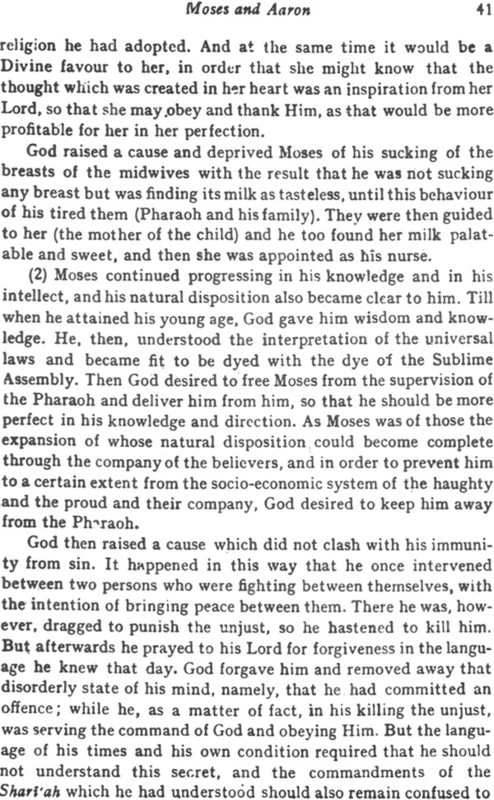 From this it also appears that it was an earthly Paradise where Adam was deluded by the Satan. ance of his perfection, however, goes by a known order (nizdm), when he gets some freedom from the veils of nature (lalbah), of custom and of the body. Sometimes, when he gains such freedom from these veils, this connection (with the Sublime Assembly), this dye and these moments of freedom assume in his senses or in his dream the form of a regular event. 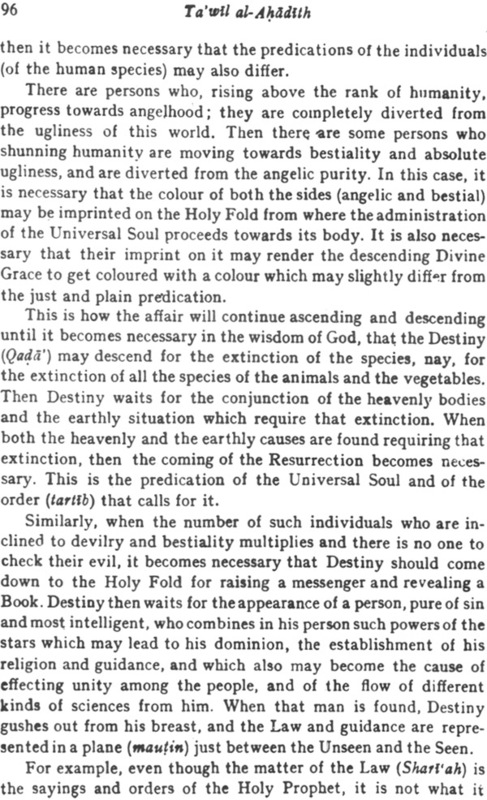 An interpretation of it is one of those things (namely, Divine secret, connection with the Sublime Assembly and getting dyed with a Divine dye). 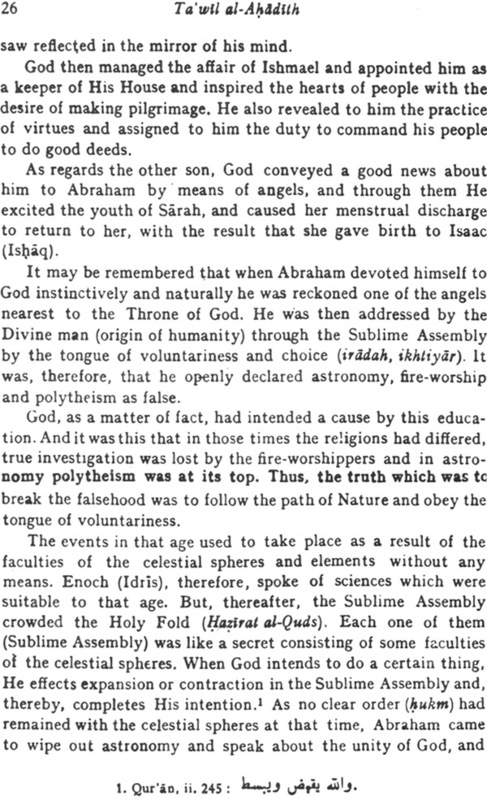 An example of it is as follows: The Holy Prophet, in the very beginning of his nature, was found connected with the World of Divinity, bearing resemblance to the Sublime Assembly and was free from every kind of impurity. As such, his nature began perfecting time after time. At times, his perfection appeared in the form of the splitting of the chest. At times, it appeared in the shape of the speech of the angel Gabriel while he (Gabriel) was sitting between the heaven and the earth. 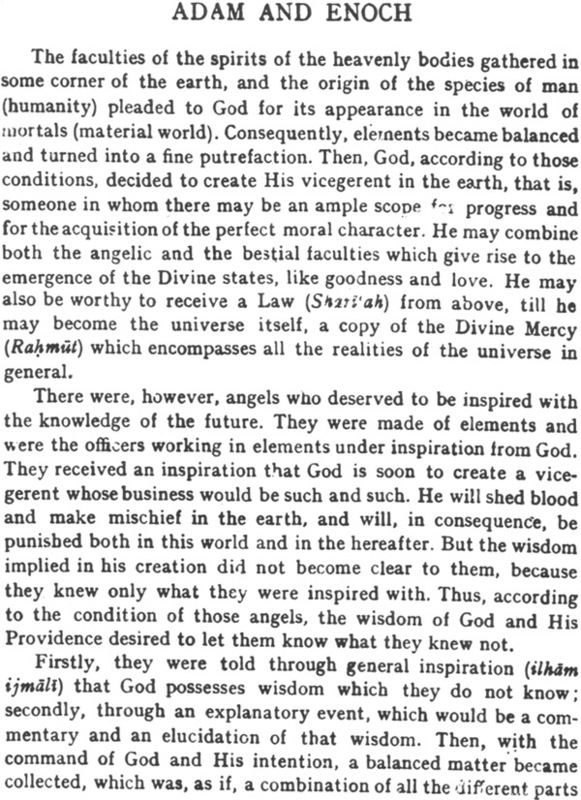 And at times, he was weighed with the rest of the people and outweighed them all, and at times, in the form of the Ascension (Miraj). Similarly, the Prophet Abraham (Ibrahim) was strong-hearted in following the law of Nature. When his nature became perfect, it appeared in the form of a happening, and it was his look upon the stars, the moon and the sun. By their setting he made an inference that they were not those who had created him. Don't you see the jealous: how his jealousy appears during a particular happening? The nature, therefore, is a principle and the happening is a form. ''The word does not change before Me. "3 These are five and these are fifty. These are fifty by language expressive of permissible liberty (lisdn tajawwuz), and five by language expressive of reality. The object In both the cases is one and the same, but God, on account of some wisdom He had in mind, concealed the reality in the beginning. 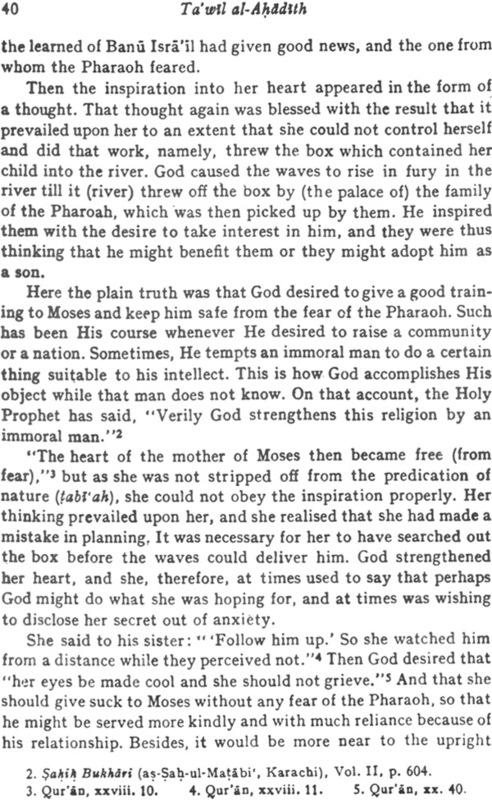 The Prophet Jonah (Yunus) had family decided upon destroying his people, while the Divine Curse had not yet reached its stage and assumed an ugly aspect. But when he turned to God and conversed with Him secretly, he took notice of that aspect. It is just like this. Someone sees a dream in which an address is represented to him in the form of a story pointing out to the rottenness of fruits and the breaking of the vessels. When he wakes up from sleep he understands that the object behind it was to draw his attention to that aspect (namely, the deterioration of his condition). To illustrate further, a person of phlegmatic nature Finds in his sleep that he is caught In by cold, is drowned in the ocean or Is smitten by snow and rain. Similarly, he who is overcome by the faculty of anger sees in his dream, when that faculty comes in a clash with his angelic faculty, that, as if, a lion is attacking him. All these things are pointing to the aspects of his mind, firmly established in it in a form that resembles the natural story. Jonah was addressed through such a story. so that it may serve as an example for him, not that it should become a general rule. Know that when God desires to manifest an extraordinary work (khariq’ adan) in order to effect administration, He does so in the form of an ordinary course, however weak that ordinary course may be. For example, a man suffers from a minor illness, and when a physician sees him, he does not pay any attention to him, as he never thinks that he would die of this illness, but the decree of God appears even in that minor illness and he dies. Thus, there are weak causes for the extraordinary works as well, which are, as if, in accompaniment of the execution of the decree of God and His Providence towards the earthly causes, so that the order (alah) should not be completely broken. There are hints both in the Qur'an and in the Tradition which give an indication of such causes. In the story, however, there is a hint and a meaning, which a gnostic understands, nay, every righteous and intelligent person can also comprehend it. The Holy Prophet has said: "When God decides for man that he should die at a certain place, He fixes for him a need to go to that place." Thus, giving rise to his need is just to take into consideration the course of voluntary acts, so that the order may not break. God willing, we are soon to point out the interpretation of every happening and the reason of the particular form it takes, and are also to point out those weak causes behind every extraordinary work. You, therefore, wait for our hints and watch with vigilance when we narrate the story.